As a business owner, one of your long-term goals is likely to create a sellable enterprise that works without you running it. Getting to that point can be a challenge, and many companies don’t make it that far. But as Adam Wallschlager of ActionCoachMN shared at a recent Breakfast Club, it’s all about the team of people who work for you – the people who can drive your business forward. Here’s the problem: most of your employees don’t understand the vision of your organization or their role in helping your company achieve its goals. In fact, only 37% of American workers actually know the goals of the organization they work for, and only 20% understand how their role contributes to achieving these goals. Even more alarming, only 15% of workers believe that their company supports their role in achieving the company’s goals. Relating this to football, this would mean that with 11 players on a team, only 4 players on the field even know where the end-zone is, only 2 people understand if they are on offense or defense, and only 1 person actually believes that the ownership cares about winning. That’s a big problem! To combat the common team issues that lead to a less than committed team, you need to develop a company culture that’s focused on strong leadership, drives towards a common goal, clearly lays out the rules of the game, gives your team an action plan, supports risk-taking and requires 100% of your team to be involved in the process. Start with strong leadership. Your leadership team should intentionally show they’re passionate about what they do, and visibly take responsibility for their actions (or inaction). Leadership starts at the top, and your employees will mimic the behaviors they see from their superiors. If the leadership team is consistently excited about the work they’re doing and the results they’re creating, while also holding themselves accountable to their role in the company vision, the rest of the team will too. Drive towards a common goal by sharing your company vision, and helping your employees understand what that means for them. Show them how their role contributes to the overall success of the business, and you’ll inspire them to do great work. Be clear about your game rules. This gives your staff a playbook to understand what’s expected of them, and what will happen if they don’t meet expectations. Be clear about who does what by when for best results. Support risk taking by giving your team the right resources to go outside their comfort zone. Encourage them to share their ideas, and try new things. Help them feel comfortable that if their idea doesn’t work, they won’t be reprimanded for it – you’ll be happy that they tried something new. Being intentional about how you lead – and the culture of your company – is the key to creating success. When your company culture is focused on creating success in a positive way, and your entire team is working towards the company vision, you create an environment where the business can function whether you’re there or not. As leaders, managers, and trainers, we’re all programmed to want to help our teams do great work. Doing great work starts with helping each employee understand their strengths, and using those strengths to identify their genius zone – where they’ll not only be most productive, but happiest within your company. At a recent Breakfast Club, John Warder shared how the 34 Clifton StrengthsFinder® can help your company better maximize the natural strengths of your employees. By taking the StrengthsFinder®, you can delve into the top five strengths of each of your employees to understand which tasks will come easily to them, and what’s not a great fit. Then, you can assign work to your team based on what motivates them – in other works, what their strengths are. When your employees are successful in their role and enjoy their work, you’ll start to see higher engagement levels, more productivity, and ultimately, increased staff retention. For example, someone who has strengths like relator, woo or command can be great at developing and maintaining client or vendor relationships. Pushing them to spend their day analyzing data will be frustrating for them, and not maximize their abilities – and likely lead them to leave your company for a role that’s a better fit. Someone with strengths of analytical, focus and intellection are more likely to align with the operational side of your business. Throwing someone with these skills into a business development role will leave them overwhelmed and unhappy – they’re likely not wired for the constant interaction and competition of a sales role. Begin by deploying the StrengthsFinder® to your staff to help them understand more about where their strengths and motivators lie. Then, bring in a strengths coach to help your HR team understand how to best maximize each person’s strengths within their role, and help individuals understand how to leverage their strengths to their advantage while overcoming any weaknesses that may accompany their particular strengths. 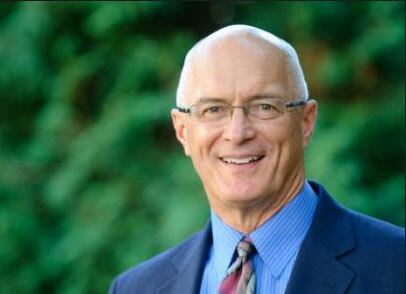 To get in touch with John Warder to learn more, reach out to him via email. The situation: We already had a professional networking relationship with the partners of Imagine IT when the company was founded in 2012, so when they were ready to start bringing employees into the mix, they knew they could trust our deep experience and expansive team to get their HR department up and running. Our work: Initially, we helped with their payroll, but as their company grew, so did the breadth of their HR needs. Slowly, they added on using iSolved, our human capital management platform, to simplify their people management. They also added on our identity theft prevention as part of their employee benefits package, and it’s become such an important aspect of what they offer their employees, that they also recommend it as a benefit offering for their client partners as well. Soon after seeing the benefits of iSolved, Imagine IT added on our On-Demand HR Legal Services program, which allows them to send any of their HR questions through our partner legal team for a flat monthly fee. This program has been so beneficial, they consider our legal partnership to be crucial to their business’s success. 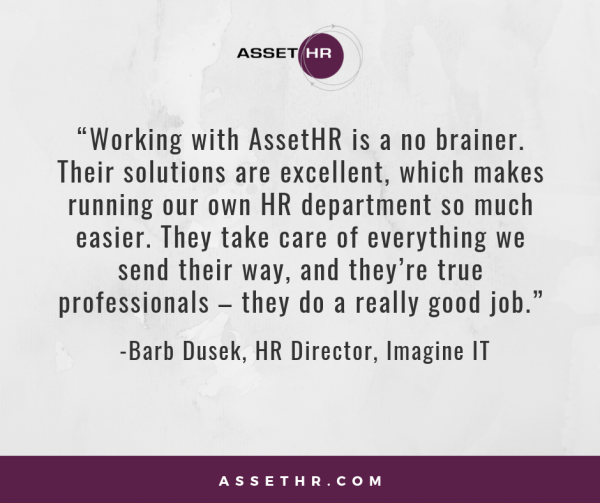 The results: We’ve worked with Imagine IT to support their growth across a variety of programs, from writing their first employee handbook to helping them find their current HR Director as their needs expanded. They appreciate that they can source all of their employee data from one place, and that we’re able to directly or indirectly slide into the gap when the team at Imagine IT has HR, payroll or benefits questions. When they have a quick question, they know they can pick up the phone and get one of our experts – who already knows their company – on the phone. This leaves their team free to focus on the big picture, resting easy that we will fill in where they need support. The start of a new year is always refreshing. A clean slate, a new set of goals, and twelve months of hard work ahead of you, just waiting to be tackled. As you delve into building more efficient HR processes and growing a stronger corporate culture, expand your view a bit. Because there’s one thing you may have left off your strategy for the year: improving employee engagement to better support the business’ growth. Engaged employees aren’t just doing more work, they’re doing better work, which sets a higher bar for the quality of your output, and gives you an edge on the competition. Engaged employees are creating more efficiencies in your business, decreasing the need for additional staff, which lowers your overhead costs. Engaged employees enjoy what they do, and ultimately have a deeper connection with the company they work for. This means more loyalty to your company – and increased staff longevity. So, increasing employee engagement sounds pretty great, right? We think so, too. Here are a few ideas to get you started on building stronger employee engagement this year and beyond. The best way to help your employees develop a deeper, more emotional connection with your company is for them to understand where you are leading the business, how you plan to do it, and what that means for them. This doesn’t just mean the dollars and cents of the business – it includes what shifts you see for your office space, how you’ll offer deeper company trainings, what impact you’d like your organization to have on the community, and how they can help support each piece of the vision. You don’t have to have every piece of your year planned out in advance of your presentation. Just offer a 10,000-foot view of the company’s goals, what the plan to achieve those goals entails, and how your staff can get more involved in initiatives that interest them in the future. Gone are the days of the annual review being the only point of feedback for employees to understand what they’re doing well, and what they need to work on. Today’s staffer wants real-time feedback on their work, not only so that they can work better, but also so that they feel like they are making a relevant contribution to your business’ goals. Create short monthly or quarterly opportunities for them to get face time with a superior, and train your managers to give real, actionable feedback for best results. 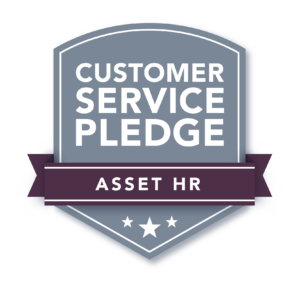 Employees today want to know that their employer appreciates them, and recognizes their hard work. One of the simplest ways to show your staff that you care is to create a fun award that can be shared once a month to showcase hard work or big accomplishments. For example, you could create an MVP trophy, or create a light bulb certificate to award all the “bright ideas” that led to a great end result on a project. You could even make it an award specific to your company – the possibilities are endless. Today’s workplace isn’t stagnant – and your employees don’t want to feel like their skills are stagnant, either. And while most companies offer pertinent on-the-job training, it’s also important to include personal and professional development opportunities, which are essential to your staff’s success in their career. From leadership development to helping employees understand how to balance their personal and professional life online, soft skills trainings are a great way to show your staff that you care about more than just the work they do, but that you care about them as people, too. If you’re ready to start building a more robust strategy for employee engagement in 2019, we can help. Reach out to Chris Kelly to schedule a quick call to learn more.